She delights in making it easy, natural, and fun for you to design a place that will embrace you when you come home to it. 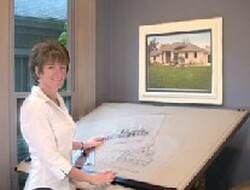 Marla established Design Evolutions Incorporated in 1998 and has designed hundreds of homes throughout South West Michigan. She was raised in a family that made their livelihood in construction and that positive experience led her to pursue a degree from Western Michigan University in Residential Design and Construction Management and Engineering. In 1999 Marla became a licensed contractor. Along with her education and experience, Marla brings to every job a passion to design a structure that becomes “home” to each and every client she works with. Homes that sparkle with personality. Homes that offer an expression of the homeowners. Homes that fit lifestyles. Homes that house memories. Give Marla a call today at 269.372.2250 (Kalamazoo) or 269.639.1617 (South Haven)!